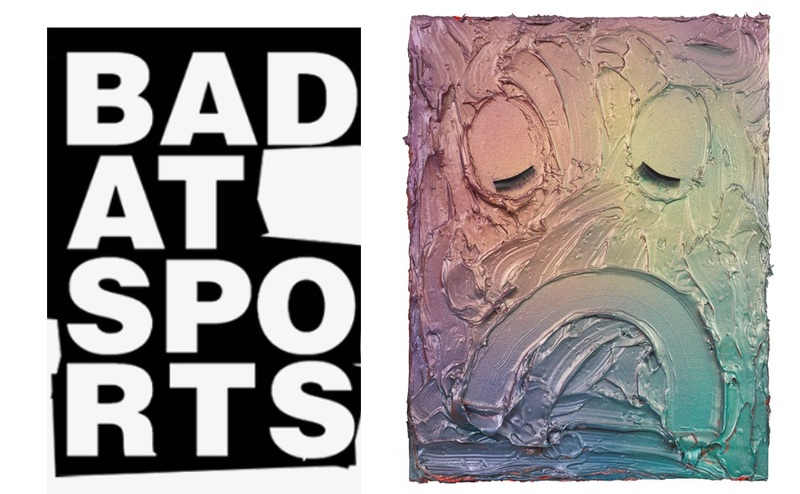 BAD AT SPORTS blog featured Material Objectivity at Baby Blue Gallery as a top weekend pick. The wonderful David Downs recently came and spent some time with me in the studio. Click here to watch the video. Voyage Chicago did a little write up about my work. Click here for more info. Cindy Bernhard has described her work as “a romantic reverie of… disappearing spaces.” The spaces she was referring to in that statement are the family-owned farms of Middle America, including the one on which she grew up; she manifests her reverie in that case in intimate but disorienting depictions of pigs – miniature? full-scale? real? toy?—dealing with existential circumstances of disorientation and alienation. But Bernhard has extended her “romantic reverie” into yet stranger landscapes, unpopulated and bordering on the sublime, but still rendered on the miniature scale that keeps her vision locket-sized, implicitly close to the heart, and dripping with a poignant sense of loss – loss of roots, loss of direction, loss of identity. This can be equally felt in her sculptures, composite objects bordering on kitsch but in fact advancing the sentiments of kitsch (similar to the sentiments found in the paintings) without drowning in kitsch’s empty signifiers and theatrics of emotion. The emotion here, subdued as it is, is real. Bernhard also credibly claims “empathy, irony, playfulness, and humor” for her art, and these factors serve to make, and keep, her work readily affecting and endearing. But these characteristics only support the main qualities of Cindy Bernhard’s aesthetic, the aspects of nostalgia and fantasy that cleave us to them the moment we study them; it is that embedded narrative quality – that sense that Bernhard isn’t simply illustrating her story, but telling it – that makes her imagery so urgent even as it floats in its elusive hypnagogy. Bernhard’s pictorial variations on themes suggested by Rumi’s Love Poems evoke the same philosophy and the same poetic spirit, transformed in a uniquely contemporary way that reveals both Bernhard’s idiosyncratic interests and vision, and the influence of many kinds of visual art with which she is familiar. The 9 x 10” paintings are haunting little desolate landscapes rendered in a variety of color palettes that evoke a range of different emotions and moods. Some are soft, muted pastels in multiple shades of pink and mint or apricot and lilac; others are intensely saturated and nuanced symphonies in hot tones of citrus or cool harmonies of violet or aqua or jade. Some depict the blue-shadowed, blinding white ambience of daylight; others create a nearly black, funereal orchestration of nocturnal tones. Each little picture represents either a subject isolated on a blank ground, or a miniature world in which vast plains and deserts stretch out before backdrops of silhouetted mountains. In some, a crescent or full moon—that ancient, universal exemplar of the cyclical nature of birth, growth, death, and regeneration--hangs like a glowing lamp against skies made of diffused washes of radiant or darkening color. In many, strange arches and jagged geometric forms and other minimal natural elements add both mystery and hints of meaning to the panoramic vistas. These are not depictions of specific places, but generalized, poetic evocations of our world...as beautiful, fearful, and worthy of reverential scrutiny as if it were an alien planet. The only living inhabitants of most of these surreal little worlds are pigs, whose presence in these simplified, exquisitely modulated environments marks them as symbols in poetic metaphors rather than genre subjects in realist representations. Everything in Bernhard’s work is delicate and fragile, and this is particularly apparent in regard to her pigs, which lack the gross porcine bulk normally associated with their utility as human food or emblems of indiscriminate greed. Bernhard grew up on a pig farm in rural Illinois, and it’s clear that her adoption of the pig as a meaningful motif derives from her Rumi-like sympathy for the sad plight of these intelligent, affectionate creatures doomed to a restricted existence and an early death. Her pigs are significant both for their own identity as sentient beings, and for their capacity to suggest the existential dilemmas that afflict all humanity as well. Whether wandering alone and dwarfed by the immensity of their surroundings, or faced with the lurking dangers of gaping pits and obstacles like the walls of a maze or barriers of chicken-wire mesh thrown down in an otherwise barren terrain, Bernhard’s small, compact black and white pigs face the perilous unknown in silence and dignity. Lost in the vastness of nature or separated from one another by wire fencing or the guiding walls of shambles, each pig becomes an emblem of the sense of isolation and perplexity that most of us suffer from as we move along the path of life to our own ordained end. They represent our poignant vulnerability to the world around us, to the restraints and limitations that block us from advancing towards our goals, to the barricades that keep us apart and conceal the future from us all. In three of the strangest and most disturbing paintings of this series, a single pig, either dead or sleeping, hangs corpse-like in the black night sky, illuminated and palely gleaming like a crescent moon seen at three different stages of its lunar cycle. These spectral pigs, elevated like celestial bodies in the darkness of the cosmos, are both sacrificial victims to be pitied and sources of sustenance to be honored, symbols of the mysteries and ambiguities of existence and of the universal rhythms of life and death that define our experience here on earth. In all the variations of this series, Bernhard explores the paradoxes we must constantly negotiate as we make our hesitant way through the world: the simultaneous beauty and terror of life, our need for love and communion to balance the sorrow of our lonely condition and our awareness of mortality, and the necessity of navigating the conflicting demands of flesh and spirit, of self-involvement on our individual paths and compassion for our fellow-travelers on this planet. Stylistically, Bernhard’s Love Poem paintings reflect a variety of affinities with previous works of art. Her artistic sensibility is one of simplification and reduction, and her pared-down scenes and generalized forms eliminate any details that are not crucial to conveying her meaning. In their focus on a few essential motifs seen against an empty or barely defined background, many of her images recall the spare aesthetic of Japanese landscape paintings and prints, or of the pastel-toned, reductive and abstracting still-lives of Italian modernist painter Giorgio Morandi, whose work she reveres. Those of the Love Poems that isolate pigs and blue-shadowed chicken-wire against plain white or colored backgrounds are reminiscent both of the exquisite blue-shadowed, white-ground still-lives of Wayne Thiebaud and of the minimalist canvases of pop/conceptual artist Ed Ruscha, but Bernhard’s philosophically evocative imagery is more profound and moving than Thiebaud’s luscious pastries and other banal decorative objects, or Ruscha’s emotionally neutral words written across empty skies. Those of the painted “poems” that feature sumptuous, sonorous color harmonies also share characteristics with the work of latter-20th century color-field painters like Morris Lewis or Mark Rothko, but again there is a difference in affect between Bernhard’s use of color to enhance the emotional resonance of her very suggestive representational scenes, and her predecessors’ purely abstract canvases. Despite their modernist aesthetic, perhaps Bernhard’s Love Poems are most closely related to the nocturnal poetic sensibility of the early 19th cen. German Romantic artist Caspar David Friedrich, whose single contemplative figures gazing out over scenes of otherwise uninhabited nature evoke a similar sense of mystery, isolation, and reverence for creation.